Oak woodland: burn it or lose it? On Dec 10 2013 the most recent webinar was held. This was presented by Dr. Gregory Nowacki, an ecologist with the U.S. Forest Service, and titled: Oak, Fire and Mesophication: Past, current and future trends of oak in the eastern United States. This was an illustrated review of an important paper that Dr. Nowacki had published four years ago with Marc Abrams with the title: The Demise of Fire and “Mesophication” of Forests in the Eastern United States. Although I summarized this paper in a blog post in 2009, I recommend watching the whole Webinar, which is well illustrated and easy to follow. 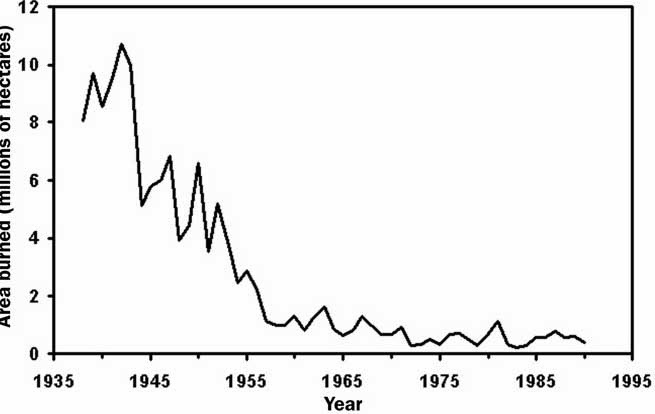 One of the most important points of the Nowacki/Abrams paper was the striking decrease in use of fire in eastern U.S.forests since the 1950s. This is illustrated in the graph below, which comes from the original paper. Missouri, Arkansas, Lousiana, and all states eastward. 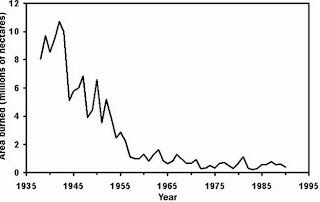 This marked decline in burning since World War II is striking. For some reason, the "culture" of woods burning apparently changed after the war. Now the goal is to change this culture back. Private landowners are strongly encouraged to burn their oak woods, at least every three years, if not more often. At Pleasant Valley Conservancy we first burned our oak woodlands in 1999, followed by burns in 2007, 2008, 2010, 2012. Although the first burn was rather spotty, it has improved with time and the 2012 burn was very good. The plan is to continue burning at least every other year, either in spring or fall (depending on the weather). Most prairie and savanna restorationists are aware that there are two classes of grasses, distinguished by a fundamental property of photosynthesis (abbreviated C3 and C4). Many prairie grasses have the C4 pathway, and because of this are able to proliferate in warmer parts of the summer when other plants are suffering from moisture stress. For the most part, prairie grasses are warm season grasses, and savanna grasses are cool season grasses. The C3/C4 differentiation is a good example of evolution in action, and botanists have been able to explain at a fairly fundamental level how these two kinds of grasses differ. I recently spent some time putting together a table that sorts out these two kinds of grasses, based on an extensive review that was published by S.S. Waller and J.K. Lewis in the Journal of Range Management (1979; vol. 32, pp. 12-28). Note that my table is just a subset of that of Waller and Lewis since they have a lot of grasses that we are not familiar with here in the Midwest. Essentially, the C4 pathway permits plants to carry out photosynthesis during warm (or hot) summer conditions, making them able to outcompete C3 plants. Note that in our temperate climate, the only C4 plants are grasses, but in the tropics many broadleaf plants have the C4 pathway. It is interesting that although C4 plants represent only 5% of the Earth's plant biomass, and only 1% of the known plant species, they account for about 30% of terrestrial carbon fixation. According to the Wikipedia article: "C4 carbon fixation has evolved on up to 40 independent occasions in different families of plants, making it a prime example of convergent evolution. C4 plants arose 25-32 million years ago (Oligocene)... and did not become ecologically significant until around 6-7 million years ago (Miocene). C4 metabolism originated when grasses migrated from the shady forest undercanopy to more open environments, where the high sunlight gave it an advantage over the C3 pathway." 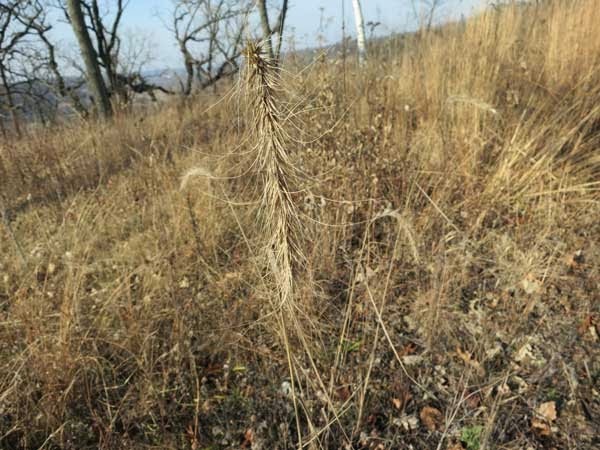 Canada wild rye (Elymus canadensis) is often a substantial part of the seed mix for new prairie plantings, since it gets established quickly and acts as a native nurse plant for prairie seedlings. Since it is a short-lived perennial, it eventually is replaced by the permanent prairie grasses, such as Indian grass, and big and little bluestem. Small patch of Canada wild rye established in the Circle at the top of the ridge. The long, curled awns are characteristic of this species. The patch here consists of less than a dozen flower stalks, mixed in with Indian grass and little bluestem.